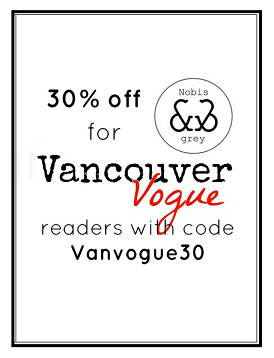 First of all, I hope you've noticed the big change here at Vancouver Vogue! Just like our wardrobes, sometimes blogs need a little makeover too. I hope you like the new look; I'd love to know what you think, so feel free to drop me a message! I ventured over to Abbotsford to check out the Little White House & Co.'s newest salon café with blogger Kassandra of Kassinka. For those of you wondering if it is as utterly adorable and classy as the one in Fort Langley, it is indeed! We had some delectable high tea before checking out the collection of Parisian-inspired home decor and clothing in the LWH's shop. I have never been very partial to the fall season, usually I much prefer summer, but I'm starting to think it's because I never had any particular inspiration in mind for fall. The problem with colder weather is that we often get sidetracked with the goal of just staying warm...and style just goes out the window. This season, however, I've developed a strong affinity towards preppy/equestrian style, and it's making me very excited about my fall closet! Shades of bright and dark red, navy, plaid, olive green, cream, and brown have dominated my inspiration lately. Another style that I'm loving lately is collared chambray shirts over sweaters. I haven't attempted it myself yet, but Kassandra pulls it off perfectly in chambray and a sparkly knit. It's such a great way to keep cozy while looking casual yet polished. This lovely lady isn't just a style maven though, she's also an up and coming designer too! I first saw her designs at UFV's Absolute Style fashion show back in May: if you haven't seen them yet check them out, she put together a truly gorgeous collection of Russian-inspired pieces. Little White House looks soooo cute! If only it was more accessible to me (I live in the Vancouver core) I'd totally go check it out.